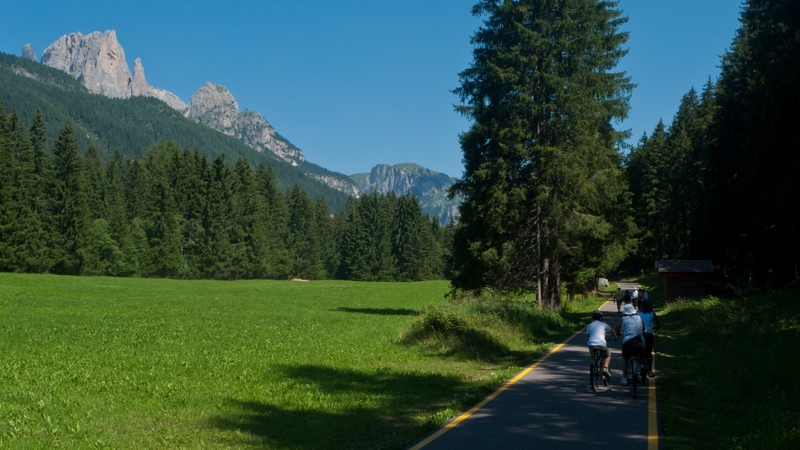 The Trentino probably has Italy’s best cycleways - although the neigh­bouring Südtirol has a pretty good claim to the title, and its other neigh­bours - the Veneto and Lombardia - are catching up. There are two major national cycle touring routes that run through the Trentino: the Ciclopista del Sole, which is part of the eurovelo 7 and runs to Rome and beyond, and the Via Claudia Augusta which offers the option of heading to Venezia or Ostiglia on the Po - where it connects with another national/​international route the Ciclovia del Po (part of eurovelo 8). Both of these routes use the Ciclabile della Valle dell'Adige. This is very popular with cycle travellers - both those heading for Rome and the south and those heading the Lago di Garda. Jump to the Overview map. The major cycleway in the area is the Ciclabile della Valle del Adige. This forms part of the national and is very popular with cycle travellers. It follows the Adige towards the city of Trento. Heading south there are three main options: many people turn off at Mori onto the Basso Sarca cycleway to go to the Lago di Garda, but the main cycleway continues south towards Trento and on from there towards Rovereto and the Veneto. At Trento one variant of the Via Claudia Augusta heads for the Lago di Caldonazzo where it picks up the ciclabile della Valsugana heading towards the Veneto. Heading north the cycleway continues on to Bozen (Bolzano) where again you have the choice of continuing on the main Ciclopista del Sole or taking the Via Claudia Augusta as it heads towards the city of Meran (Merano). 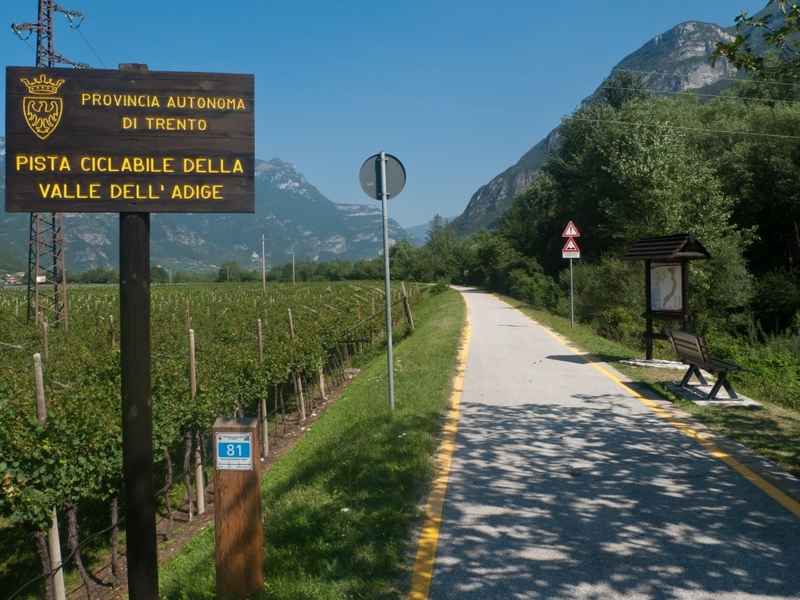 The cycleway within Trentino is 89.3kms. Entirely traffic-free and surfaced. Th Trentino-Garda cycleway (also known as the ciclabile del Basso Sarca) is cycle route runs for 16.5 kms from Mori to Riva del Garda via Torbole and Nago. The traffic-free cycleway runs between Mori and Nago - 8.7kms: the rest of the route is on quiet roads. 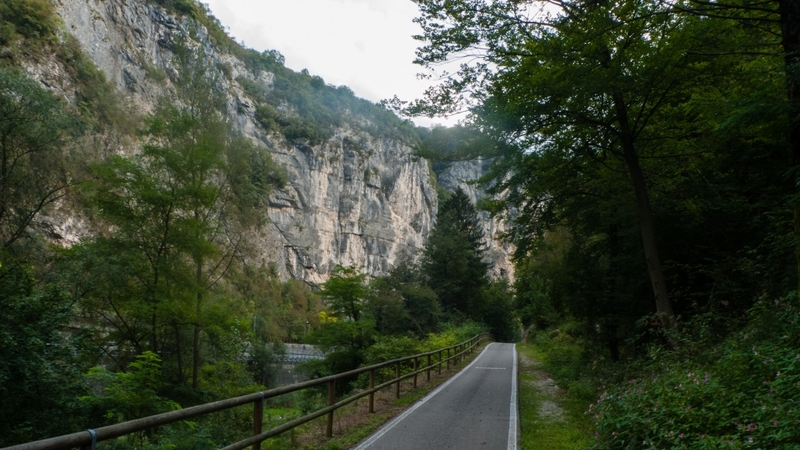 The Valsugana cycleway follows the Brenta river through the dramatic Canale del Brenta - on either side of the gorge are massive 800-metre high rock walls. The core of the cycleway is surfaced and traffic-free, but there are sections that follow quiet roads. It runs for 50 kms between San Cristoforo al Lago and Primolano. If you are following the Via Claudia Augusta the route turns off towards the town of Feltre, but you have the option of continuing, following the Brenta river, to Bassano-del-Grappa and from there via Padova to the coast near Venezia. The Ciclabile delle Dolomiti di Fiemme e Fassa (also known as the Ciclabile del Val di Fiemme and Val di Fassa) runs for 48kms from Molino del Fiemme to Canazei, from where you are in reach of the Marmolada glacier and some of the most famous passes in the Dolomites. When I rode the cycleway in 2012 they were busy asphalting the only unsur­faced section of the cycleway between Fontanazzo and Canazei. 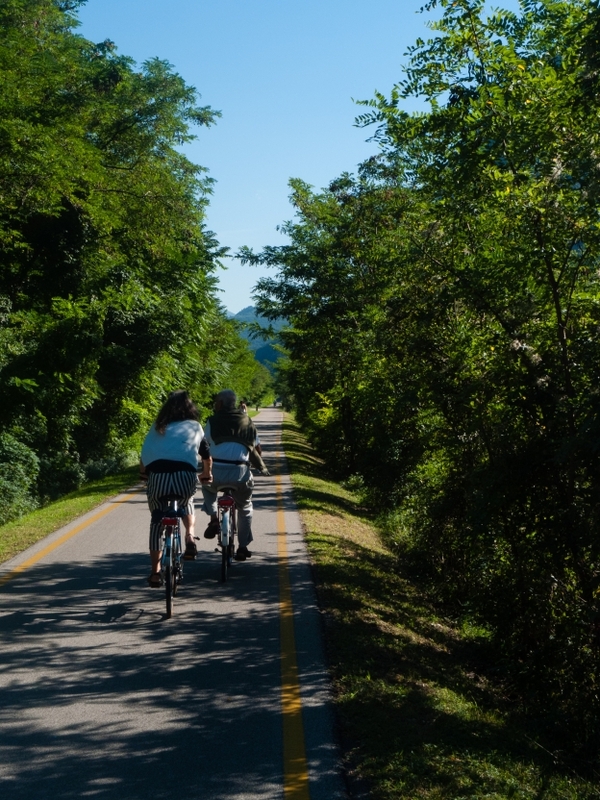 The Ciclabile del Val di Sole (Vale of Sunshine cycleway) starts at Cogolo (although it’s defin­itely worth making the climb to Pejo) and runs for 35 kms from there, following the Noce river to the bridge at Mostizzolo via Malè, Dimaro e Pellizzano. A section of the Val di Sole cycleway forms part of the DolomitiBrentaBike and you can follow the route from Dimaro to Madonna di Campiglio, where it connects with the Val Rendena cycleway. There’s a fairly big climb on an unsur­faced track - but when I was there a local taxi-driver had just invested in a cycle trailer and launched a Bici-Bus service. If you are heading towards or from the Passo del Tonale and the border with Lombardia, the cycleway provides a peaceful, scenic, altern­ative to an otherwise dull (and fast) road. The Ciclabile della Val Rendena proper starts at Pinzolo, but there’s the option to start at Sant’Antonio di Mavignola near the ski resort of Madonna di Campiglio and from there cycle for 34 kms via Carisolo, Pinzolo, Darè and Villa Rendena. There is a variant of the cycleway that leads on quiet roads to the little church of Santo Stefano at Carisolo. The detour is well worth the effort to see the frescoes by Simone Baschenis - especially in mid-summer when the volun­teers open the church to visitors and you can see the magni­ficent fresco of the visit that Charlemagne (‘Carlo Magno’) allegedly made to the area. The route is surfaced. Note that the descent from Sant’Antonio di Mavignola is relat­ively steep (even steeper if you have to climb it). The Giudicarie cycleway (proper title Giudicarie Inferiori - also known as the Ciclabile Valle del Chiese) will link the Lago di Ledro with the Val Rendena cycleway. There is continuous stretch of cycleway running from Condino south for the final 10 kilometres, and some newer sections of cycleway and cycle route between there and Tione. The local author­ities in the area have now (Autumn 2013) given the go-ahead for the completion of the cycleway - committing 10 million euros to the work. This cycleway runs for 38kms from Torbole on the Lago di Garda north to Terlago. 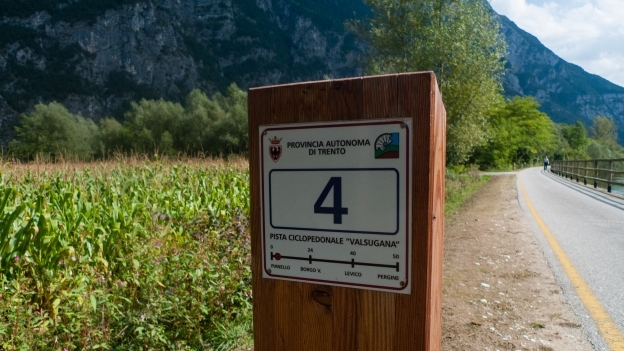 The first 10 kilometres following the river Sarca are mainly traffic-free (with a brief break going through Arco). 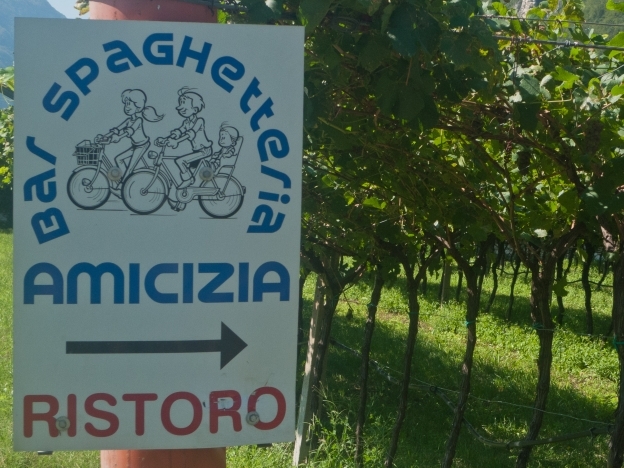 There’s then about 14 kilometres on quiet roads to Pietramurata. At this point there’s a gap which means you have to take the busier road for three kilometres before turning off to go round the Lago di Santa Massenza. From Vezzano a second section of cycleway takes you onto Terlago. 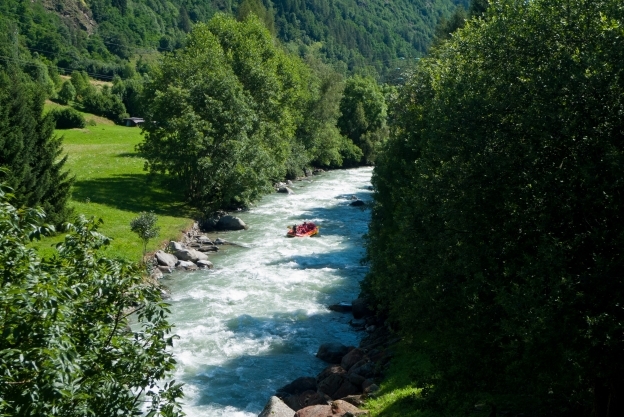 The Valle di Ledro cycleway links the Lago di Ampola - 13 kilometres. 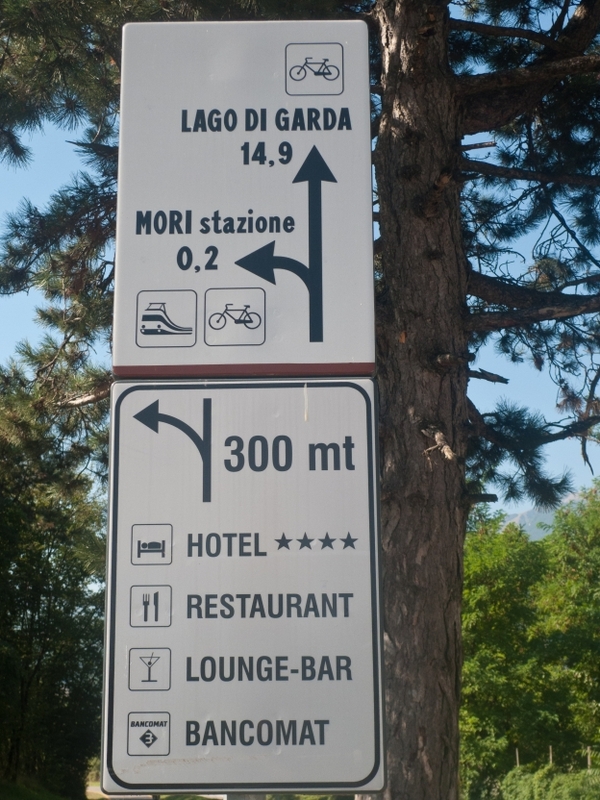 Not all surfaced - section on the Lago di Ledro unsuitable for road bikes. 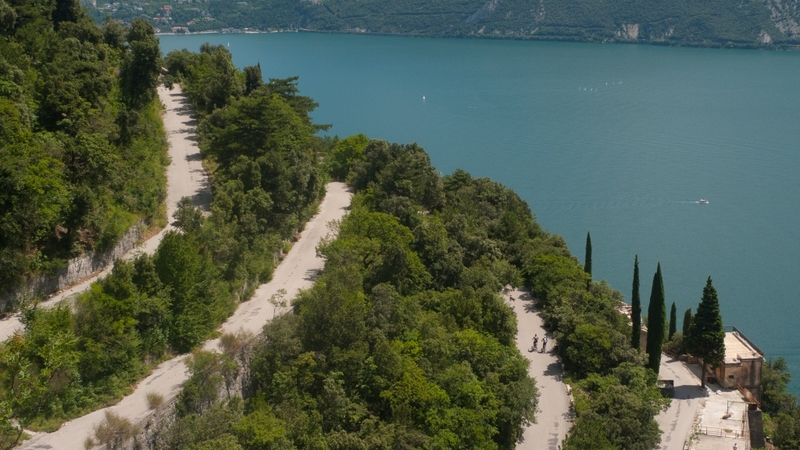 the cycleway takes you almost, but not quite, to the Lago di Garda, but a short ride on back roads gets you to the Strada del Ponale which takes you down to Riva del Garda (see brow for more inform­ation about the Strada del Ponale. The Val Rendena cycleway forms part of the DolomitiBrentaBike circuit around the Brenta Dolomites. This comes in two variants the Expert which is a challenging mountainbike route. The less challenging variant is known either the ‘country’ or ‘family’ route. Most of this route is pretty easy, but bear in mind that there is still an unsur­faced climb from Dimaro to the Campo Carlo Magno above Madonna di Campiglio. Valle dell Adige and Valsugana cycleway: this is a bit tricky (or at least I managed to end up on the narrow strada statale as it climbs out of Trento - I should have taken the less direct route). See the inter­active map for the Via Claudia Augusta. (Alternatively you can always get the train). 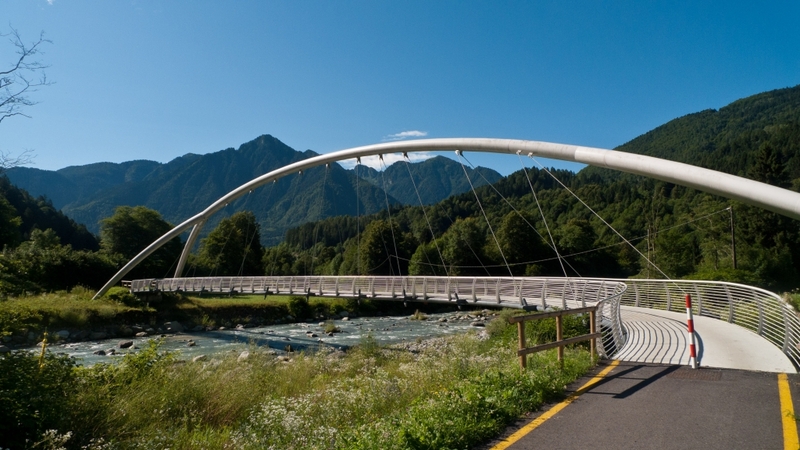 Valle dell’Adige and Dolomiti Fiemme e Fassa cycleways: you can connect between these following the course of the old Predazzo-Ora rail line as it leads to the Passo di San Lugano. This is not surfaced and the provincia advise using a mountain bike. You can also follow the very scenic SS612 from Lavis through the Val di Cembra. Note that there is a tunnel at Grumès but you can avoid it simply by bearing right through the village. Unfortunately the bike-bus service that operates along the route doesn’t seem to connect with the station at Lavis - but it might be worth asking the tourist inform­ation office especially if there’s a group of you. the DolomitiBrentaBike and the Valle dell’Adige cycleway I think the best bet is probably to take the SP64 road from Andalo via Fai della Paganella and from there to Mezzolombardo. At Mezzolombardo there’s a scary-looking junction and a couple of tunnels (off-limits to bikes) fortu­nately you can divert off go under the main road and into Mezzolombardo itself. From Mezzolombardo you take the SP29 into Mezzocorona crossing the Noce river, and then continue over the Adige to pick up the cycleway.